A month ago, I cheekily followed the Amateur Gourmet's example and started a "spin-off" blog irreverantly but hopefully named my Shameless Wish List. A combination of wishful thinking and online scrap-booking of things I covet or am just curious about, I did not expect anyone to read it except myself. It was my Aladdin's cave where I played Midas ... rubbing myself luxuriously all over with my dream list in guilty and secret debauchery. Thus, I was surprised when a couple of people read it and made amused comments at my blatant greed and cheekiness. Not surprised they noticed my shamelessness (how could you miss???) ... just that they read it! 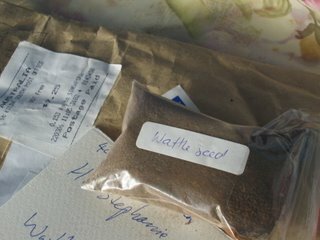 I almost fell off my chair when Ed from Tomatom responded by offering me a sample of wattle seeds - something I had read about and was itching to try. What a lovely, generous offer, especially as I had never "met" him! What a gent! I was incredibly touched and my faith in mankind (and the effectiveness of shamelessness) was completely restored. I will not go into details about how the seeds finally got to me ... I will just say the words "clueless housemate", "confused post office", and "exasperated MM". Anyway, I finally got my grubby little hands on the package and I was so excited that I almost missed the lovely message Ed sent as well. Ed's revelation that that he never used the seeds in a "proper" recipe worried and challenged me. I was worried I might not be able to recognise a "proper" recipe ... and even if I did, would not be able to get along with it. Ed mentioned that he used the seeds in cakes and things which also does me little good since I seldom bake. Still, I would give it a royal try just to get a measure of the powerful-smelling seeds. These wattle seeds are potent! The smell was so overpowering that opening the bag released a waft of nutty coffee-like musk that sent my head spinning. I loved it! Till I started sneezing. 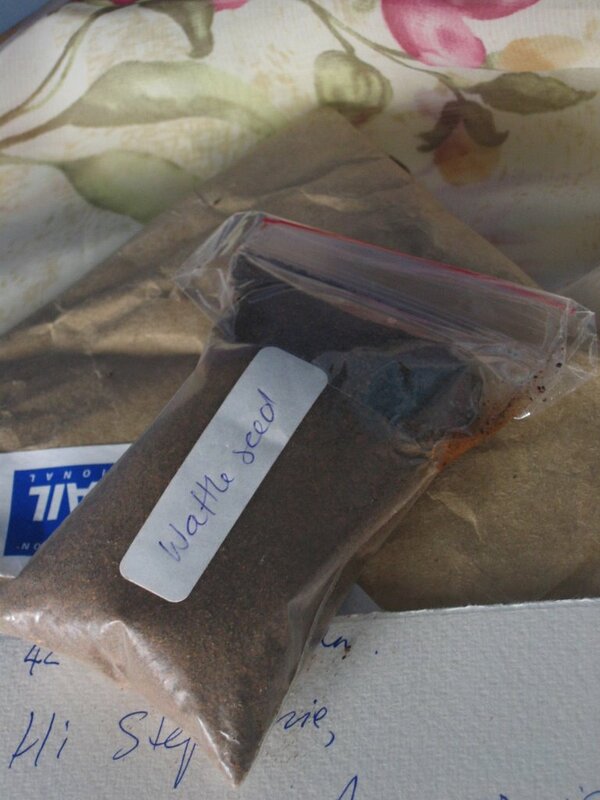 It took some getting used but once I did, it seemed to seep into my subconscious as I dreamily pondered rich cakes and sauces using the wattle seeds. Does anyone know if they cause hallucinations??? Hi Stephanie! I only recently discovered your shameless list (and good for you - I have actually considered making my own since!) but this is just wonderful. I've actually made new friends on blogs trading hard to get goodies before too! You might also be interested in trying Blogging By Mail sometime, just for fun, because you get to pick out fun food gifts for people and shamelessly get some in your own mailbox! If I knew a link for the current one, I'd put it here, but unfortunately I don't...I'll keep my eye out for it if you're interested. Can't wait to see what you do with them! What on earth are wattle seeds? Very intriguing! Wow. I don't even know what wattle seeds are but I'm very excited for you! Okay, I just looked it up and I think I understand what wattle seeds are...but what do they taste like? Can't wait to hear what you think of them! erm...cari cari tetapi tak ada. maaf ya habibtee. tetapi ada khabar baik - saya pernah cuba teh wattle di Melbourne. Rasanya boleh lah. Dalam English: "Hmmm...I say, it tastes rather odd, what...probably an acquired taste eh"
Michelle - Thanks! I only knew about Blogging by Mail after the whole thing was over! I think it's on IMBB but I do not think it's going on at the mo. Pity ... but I've been rather lucky to have nice peeps like Ed and Brendon sending me stuff. Diane - they are rather intriguing. I just tried them a few days ago and it takes some getting use to! Thanks for visiting & commenting! Gourmetish - Thanks! I will post a little experiment I did with them soon but I still have not really explored them thoroughly. Hinata - What a brilliant idea! I l'm all for it! 3A - I know you don't like it because your face when I mentioned it was hilarious! Riana - I will certainly try!